Click here to view the Progress Maps by Dr. Michael Kuo of mushroomexpert.com. Dr. Kuo uses information from the "Sightings" page and several morel discussion boards to compile weeky progess maps. Smallest Morel: Justin Burris, Springfield, IL, .875 inches tall + .875 inches girth = 1.75"
We found 58 nice sized morels in Arizona (Sedona area) on March 29 and 31. Being from Indiana, we're guessing that the unusually large rainfall in AZ must account for this. Found one small gray in Harrison, AR on 3-29-05. Warm weather and damp ground hopefully is sign of a good year. Larry, Denny and Don get packed and ready to go. See you soon. Jim H.
Hi, my name is George L. and I am in Monterey, California and think I have spotted some Morels sprouting around my office. 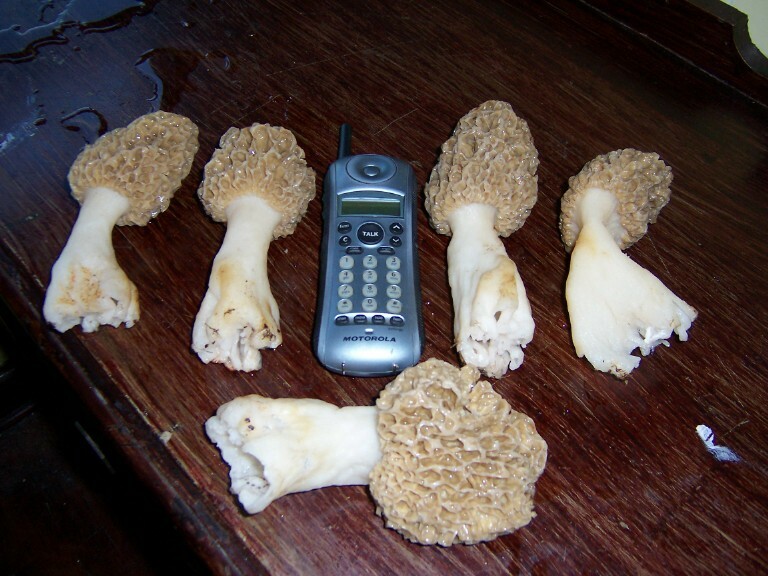 Could you E-mail information about distinguishing poisonous vs. non-poisonous Morels? The specimens I am finding have the correct shape but the stem is translucent yellow in color. I'm not crazy enough to eat these till there is positive identification. Your prompt reply will be greatly appreciated. 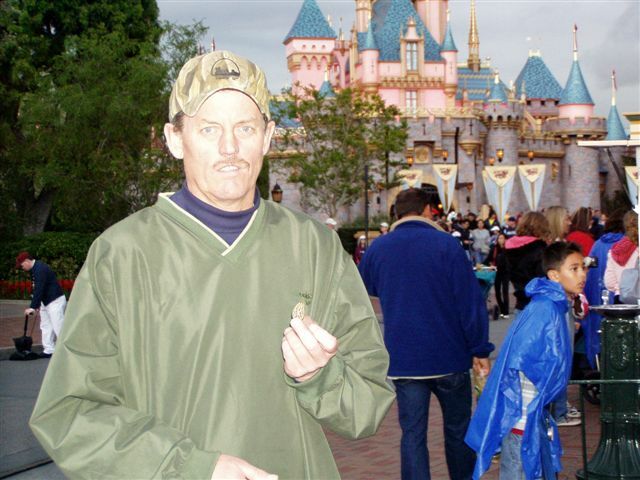 Bill B. from Stockton CA. Last night I was taking a walk through the back yard. In the back planter area I noticed the ground cover was lifted upon inspection I found this years first Morel. The Morels are of the gray verity, and the one I choose to eat was three inches in height. hey,Tom,thought i*d let you know i have a freind lives in cave junction,oregon. southern ore, 30 miles from calif. shes just found morels in her yard she lives out of town,she said there about 3 weeks early this year. just passing on information,. later dude. On May 15, 2005 my friends and I collected in about 3 hours as many morels as we could carry from a 2004 burn area at about 5000 ft elevation in El Dorado National Forest. Flush is so good that we left many smaller srooms behind. With ongoing rain events in the area, it appears fruiting will continue with gusto in the next couple of weeks or so. Wahooooo Season is finally to North Idaho. I found my first 3 inch blacky north of Hayden on an East facing hill on 04-22-05.
found our first three, 23rd lewiston idaho . nancy here in christian county, il. found five going out to see if there are more. april 3 2005 at 9:30 am. getting my bag and going back. HAPPY HUNTING and hope it's a good year. 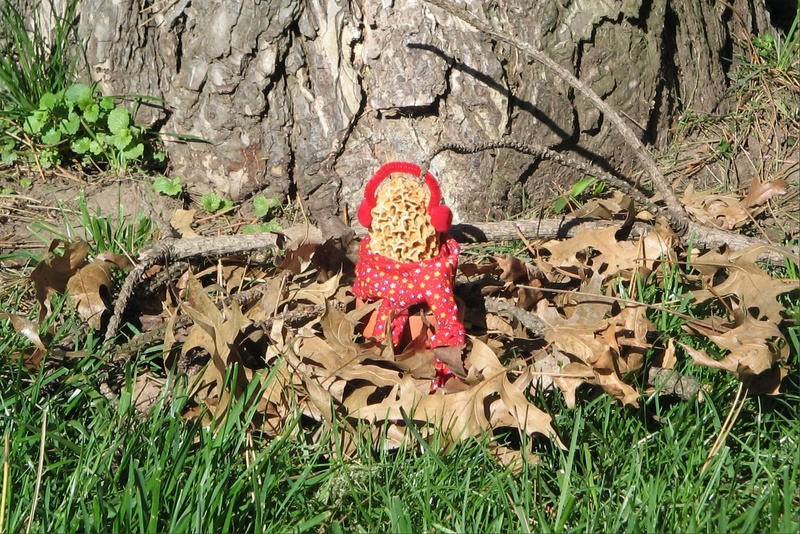 Jay of Sangamon County, IL phoned from his patch to let us know he was looking a two gray morels. One the size of a BB and the second the size of a kernel of corn. Granted, not much of a meal, but a sure sign that the season is soon upon us. I'm 9-year old Matthew Hanley, son of Mike Hanley of near Kickapoo, IL. 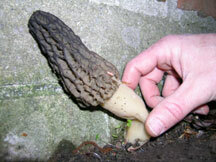 I found my first mushroom, a gray morel, on April 4, 2005. Hello from Jimmy D here in East Central Illinois. Found 7 very nice black morels this morning in my favorite spot. Have never found them this early before (April 6). Maybe this is a sign that this will be a good year. Calling for a rain tonight. That will help. Went to the strip hills today , found 72 greys. need rain. Western Perry county. Matthew Roe in Peoria found 27 small grey's in our back yard! This after traveling 200 miles yesterday to find nothing at all...go figure. 'Tiss the season to be jolly, we found grays north of the Peoria area. We reported last year on the 17th, this year the same spots produced 29 on the 12th. Hopefully the year will be better than last, good luck, the Reed family a year older and a year wiser. Shawn in Mapleton, Illinois. Morels have been out in southern part of Peoria County, Illinois this past week. Found 11 greys on 4/13, followed by mixed greys and yellows the following 4-5 days. Have picked about 90 total - mostly greys, but a surprising number of larger yellows. Several mushrooms in the last couple of days have been very dry. A good rain (soon) and we should have a nice crop of yellows popping out in this area. 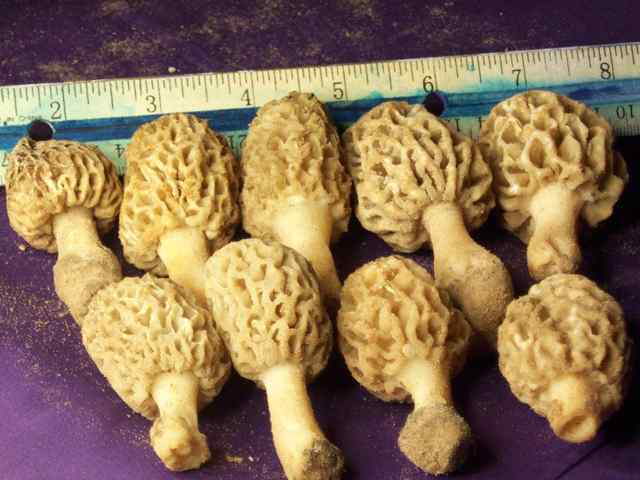 Tammy and 3 pals found 31 gray small morels in Shelby county of Illinois. Most were very small and in clumps of 3 or more. A couple were out apart. Low to mid ground level. It's Alex K. I went out last Thursday and Saturday(14th and 16th), and found a few(50-60) in my two regular spots in Godfrey, Illinois. It is really too dry right now and many of them were dried out. Hi, Roger here again in Athens, Il south Menard co.my buddy&i went behind his house along an old fence row &found 80 greys some growing in bunches of 5 to 8 mushrooms.Looks like a very good year so far.Going to the south east inCrawford co. to hunt some more this weekend.Happy hunting. We got a couple days of rain here in Jackson county, and now a couple days in the upper 60's/lower 70's and sunny. I have found about 50-60 greys and yellows. It's been a real mix. Some as small as a quarter and some as big as 3". Haven't found a real mess yet, just sporadic patches of 5-10 or 1 at a time. I'm still havin a good time!! I found a whole 5 more in Peoria County, IL.on 4/15. It was almost dark and I just had to stop for five minutes. That's what I found. three were tiny, but two were the length of my thumb but 2x's as fat and grey. Slowly but surely they are coming. I foun about 30-40 today (Sun. 4/17). Some were grey and the rest were yellow. I even found one "arrowhead". Most of them were all on the verge of drying up. Most of the ones I found were feeding off of a natural spring nearby, on a south facing slope. The forcasts lookin good though....lets be hopefull! Jason Parish Cerro Gordo, IL. Hey its Bill. Me and a friend found a total of 18 very small greys between today and yesterday on the edge of the woods. It was in the Kickapoo area and we was on our hands and knees. We need rain. On April 18 found 20 grays & 30 yellows in Fulton County. Grays small but nice & fresh. Yellows dried out & already starting to deteriorate. Parts of Fulton County had 2 inches of rain last week which has definitely helped. We found over 100 grays, small and large in a small area just behind our home. Taylorville, Illinois. Hello from Sangamon County, home of Lincoln central! Went out Sat and only found a handful of half-frees. Haven't had rain since last Tues. so didn't expect anything, but decided to check my "test patch" just in case. Were we surprised to haul in 2+ lbs of beautiful greys and yellows! Nice sizes, some 4" or better. They are a tad dry, but not shriveled. Found them in all sorts of terrain, not really under any particular tree. We ALWAYS seem to find them under wild rose bushes! Unless we get the promised rain on Thur eve and Fri. there will be no new growth. Too dry. Will go out tomorrow to a much larger woods we know of, and let all know how it goes. Good luck to all you shroomers out there! Hey its Bill again, we found 118 yesterday by Kickapoo mostly yellows and 77 the day before near Glasford also mostly yellows. I had two very good days, April 20-21 in McLean Co, Central Illinois. The first day I picked about 15 lbs (yes that's pounds). Day 2, I got about 50 morels. All seem to be the gray variety but a few were almost yellow. All were around dead elms. The weather had been warm, sunny and dry the days prior to my hunting. Then the rain and cool weather hit. I must of hit the right day, April 20. Here's a couple of pictures to go along with the sightings. DT in McLean Co.
Hey, Mike here from LaSalle Co. picked 35 grays today and just hung up the phone with my buddy who finished turkey hunting today. No bird, but, 300+ gray's and yellows. Put all he could get in his decoy bag for today. Going back to get the rest Sat.. Definetly a better start to the season than last year. Good luck to all !!!!!!! Jimmy D from East Central Illinois. Found 86 yellow morels today with a combined weight of three and three quarters pounds. All within a 20 foot arc of a (you guessed it) dead elm tree. April 21, 2005. Happy hunting. Since end of March,I have found approx. a couple dozen of what I call the whites around the Kingsport area in east Tennessee and Gate City Virgina. Hope this recent cold spell hasen't set them back. We had up to 3" of snow in some areas on Sun. the 25th April. I plan on looking again today since it rained yesterday and had some warmer temps since Sunday. dave from danville il. has found over 100 nice grey mushrooms and about 30 or more yellow. this is going to be a good year if it warms up some. happy hunting. We went out this evening after a day and a half of rain totaling 1"-2" in the area. Found 85 mixed grays and yellows. The rain sure has helped but now it's supposed to turn off colder for a few days. Hey its Bill again, we found 24 today and 38 yesterday mostly yellows in the Kickapoo area. Some are even drying up and getting burnt. I've been taking pictures of morels this year so if you want to see them check MorelPictures@groups.msn.com Over 200 pictures. Found today 4/24, pretty cool this week, but just had a long soaking day of rain day before yesterday. I'm ready!!! Lets go! On Sunday, 4/24 three of us found about 200 yellows and grays (in 2 hours of hunting) on NW facing slopes in Knox County IL. Most were on the lower areas of hillsides. On Wednesday, 4/27 two of us found about 240 yellows (in about 3 1/2 hours of hunting), again on NW facing slopes in Knox County IL. They were larger on average than those found three days before, with the biggest measuring about 7 inches. orm R.
We found greys and yellows for a total of 18. I think it's going to be a good year. Lawrenceburg, Ind. I've been finding yellow's and grey's for the past week . But today saturday the 30th of april only found a few 5 or 6 but they were dry. I hope we get some rain or it's all over with and I should know. Not to boust but I've been at the game for 30 yrs. Do a rain dance and we minght get more to pop up. I'm a novice morel hunter who got the "morel fever" 2 years ago from a business contact who went out every year hunting. That year I found about 7 or 8 close to my home in a suburb of Chicago. Last fall my husband and I bought 13 acres of land about 5 miles outside of Princeton, Illinois where today we found our first morels for this year. We found 11 blacks? (not sure about the kind yet) after about 1 hour of searching. They were on a slope at the edge of the wooded area. Went out this afternoon 1/2 mi nw of riverside hospital!! Found 13.5 lbs in less than an hour after turkey hunting. Mostly yellows and some large greys. The thing different than normal is the groups coming out of the same stem. Numerous clumps of eight to ten and one record thirteen. Near the Quad cities, Il. I wasn't out for long today but found five fresh 6" yellows west of Peoria. They're still out. we picked about 3 dozen big yellows near our favorite site - they were definitely on their last legs but still quite delicious at Sunday dinner. There were a couple that we did not pick because they were shot but it was nice to come home from Texas and get one last Northern Illinois hunt in. FYI - these were found in a Cook Country Forest Preserve at the far northern edge of Cook County, about 25-30 miles north of downtown Chicago proper. Hey, everybody. Glad I finally got to report in. I found 6 yellows in a Cook Co. forest preserve yesterday. Just 2 were fresh. Looks like today should be a good day too, up here. Hello. I was just writing to let you know that my cousin went out hunting some morels about a week ago...specifically March 26th and 27th. He found a handful of black morels. washington county indiana...my son went for about an hour sunday 4/17/05 found 20 greys of fairly good size. just a couple had been up for more than a day. just need a little rain after all this too warm weather. luck to all you morel hunters, the season is just beginning!! yesterday on the 23rd we had a terrible cold front blow in with temps down in the upper 20's and snow flurries while working last night I happened to get stopped Just After day break at a field with a couple of cotton wood trees there and thought i might have a look anyway well to my surprise and 45 minutes later i came in with 38 morels from the Calumet Indiana area. Morels Are Popping in the Northern half the state !!!! Is this year's hunt going to be a lost or what. Do a rain dance. 5/4/05/ streator Il. found 10 morel mushrooms today April 8, 2005 in southern Iowa, Wapello Co. They are about 1/8" high, well watch them grow and then pick them - they are here! found morel mushrooms in southeast Iowa today April 8, 2005. They are about 1/8" high, weather is warm and we are getting rain off and on - expecting a good season. Cheryl S.
Found two little pimpsqueeks about the size of a quarter down at the old hotspot. 4/10/05 Dubuque County Iowa. 2nd time out 4/13 and starting to find the bigger yellows. About a pound, found in south east IA. Only expect it to get better. Dallas county Iowa, found since 4/15 small grays collective over the past three days 100 +. They are tiny and takes a lot of work to find. Beginning to find some larger ones today. Hope for even bigger ones as the week continues. West Central Iowa - Went looking in a couple of different places today but didn't find any. It has been wet enough they say but maybe not warm enough... Then again, since we have never hunted them before maybe we missed seeing them. Found 29 yellows 2"-4" today, April 17 in Boone, Iowa. Iowa- Linn County has little grays. Went out 4/17 and found a nice mess to calm my taste buds. Happy hunting to all. Found a couple of pounds today 4-22-05 near Coralville lake north of Iowa City, Iowa. Most were gray but had some size to them. The ground is plenty moist, just need a little more sun and humidity. The largest morel was about 4 inches tall. We found about 1 1/2 pounds of grey and yellow by Villisca, Iowa today, but they don't seem to be out just too good yet, next warm day will be better! We found about 20 today in Northeast Iowa, Clayton County. Hi Tom, My husband was out horse back riding and found these in the hills near Glenwood Ia. yesterday. (pics from yesterday) I found about 10 pounds near Cresent Ia. April 24.
along west Nishnabotna River 6 pounds 11 oz. 5 inch yellows old growth timber edge. All around 1 dead elm tree. What a blast. About 1 pound found in other areas of same timber. Hey, this is Ed over here in Taji, Iraq (civilian contractor-helicopters) and I am planning my two week vacation, hoping you all near Derby & Agusta saved me some for last week of this month. Found 79 greys and yellows today (4-6-05) down by the rivernear Topeka, Ks.. Very small, most 1" or less. The big ones will be on the way. My boys and I have found 486 greys and tans from April 7-10. On the River near Topeka, Kansas. The Paden family in Horton Ks started picking in Central Kansas Thursday 7th of April, by Tuesday they had picked over 825 morels none taller than 4inches. Pray for the cool weather & rains to stay with us. Found 56 little grays 4 elephant ears along the river in NorthEast Kansas on Ft.Leavenworth. First of the season for us They were delicious.!!! Tammy. We found about 50 small mushrooms this afternoon, in tuffs of moss and fringes thereoflargest was 1 ½ inches. All grays. Northeast Kansas. Hi my name is Greg I hunt morels every year on the kansas river between Lorwrence and I 435 and I use a jetski to get to my finding places last sunday I found 200 mushrooms Sunday night it rained and rained good on monday so yesterday 4/12/05 I went back to the same places and in the very same spot I found another 500 mushrooms that had poped up after that good rain we had. And I find that alot if you find musrooms in a spot in a few days and for sure if you get a good rain that 8 out 10 times they will be there again Greg. the mushrooms are up in Kansas! Everyone I know is finding them like crazy. We went out last night for about an hour and found 2 1/2 lbs. We took the kids they loved it. My oldest son (11) sounded like a broken record - I found one, and another and another and another. They were everywhere. We have a spot we go to every year and actually started to find them in places we had not found them in the past. I believe that is because we use mesh bags to carry our shrooms in and the spores fall out as we're going through the woods. Not bad for our first hunt of the season. We will definitely be out looking this weekend! Good luck to all you hunters. Hi, my name is Greg Shubert. We have been finding them in Barren Co. KY. Found 80-100 last week. They were almost all blacks. 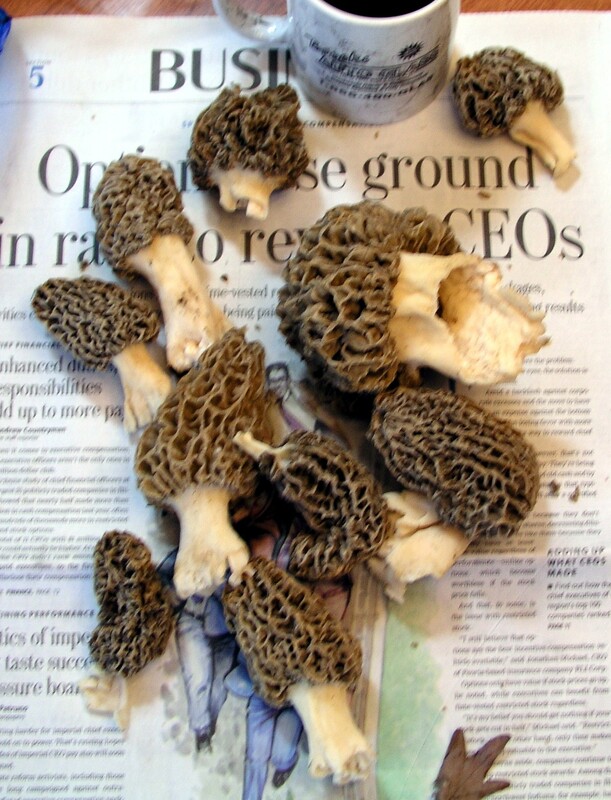 Jim Maynard Found 3 Blacks under Old pine trees on 4/1/05, going to eastern KY this week I always fine morels there in late March and 1st week of april. will report back in a few days. Thank You. I just wanted to let you know that I went out in my favorite little spot and found four black morels. The largest was about 3" tall. I am in the Ft. Knox, KY area. Friday April 8th 2005. 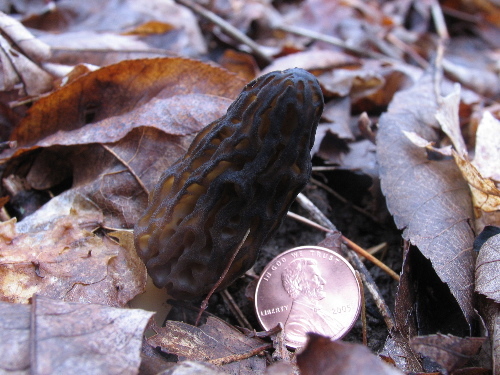 Klaus W.
Found one small yellow morel yesterday along with 4 nice blacks, two of which were over 6" tall. They're here! Rockville, Maryland. Found four small grays during a brief search at lunch. They were growing among pine needles from what I call a "landscaper's pine" (quick growing pine tree with long needles), chickweed and other ground-hugging wildflowers. Near Baltimore, MD in mixed tulip tree & silver beech woodland: Found 10 good sized yellows (4"+) and 2 half-frees but we really had to work for those. Four of the yellows were in pretty far gone (dry and/or moldy) so they were left to spread spores for next year. We aren't sure when these would have come up because until late last week it had been hot and dry. However, judging from their size and condition they had been up a while. It should continue to rain on and off and the temperature will rise slowly which I hope will spark a steady wave of morels. We'll see. Happy Hunting! Found over 200 morels near Baltimore, MD. Yellows, greys & a few half-frees. Most the the half-frees were old/water-logged. Most of the other morels were 2-3" but a few monsters were 6"+. Thank goodness it rained yesterday. We'll probably cook the first batch tommorrow because right now we are too tired! Picked about 90 near Baltimore, MD. Most were good sided yellows with a few 6" + monsters. Many were on that fine line between dry and TOO dry, and we left about a dozen that were just too far gone. For eating that is. Hopefully they will still spread spores. I hope it rains this week, that should add time to the season. If not, it has still been a good year. (We also had a morel hunting first on Saturday - A deer tick picked one of US. Yuck.) Happy hunting to all, especially those of you who are still waiting for the season to start. And watch out for the blood suckers. I found around 15 on the 6th of May in a landscaped area of an office park in Lexington. I'm not sure if you would call these yellows or grays. We had more rain this weekend so I am going to go back and check them again this evening. Shroom meister George here. Just hoping for a great season. Went looking in the Mesick area over this past weekend, but still snow covered, and not much in the way of green covered floor. Will be back up on 04/09, and expect to find some then. Report to follow. Black morels found today 4-22-05 near Alden, MI which is 18 miles NE of Traverse City. Found 5 in a space of 10 minutes. Going out for more. 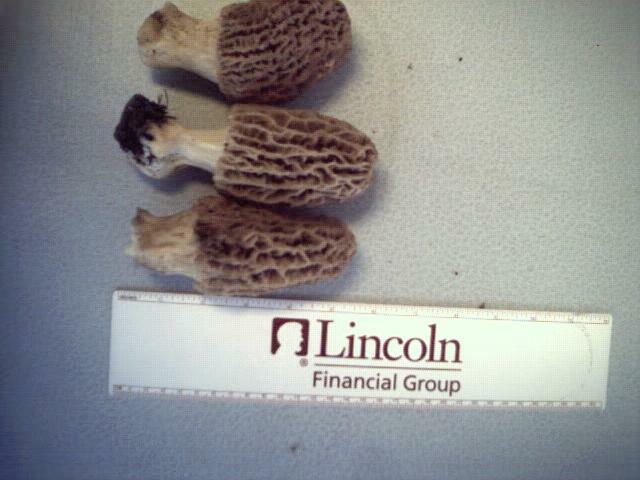 Mark C. found 3 black morels aprox 1/12 inches in height in Ogemaw county on 4/22. Going back on 4/30 will update upon return. Hi, April from Calhoun County. Found five blacks yesterday, but are supposed to get 5-8 inches of snow tomorrow. Only 6 brave & dedicated members attended the hunt at Lapeer. the weather was terrible, cold & wet snow. The good part is that every one found at least (1) morel. when we returned to the parking lot everybody ran to their cars & put the heater on to warm up after the 3 hour hunt. We did not count mushrooms but I did find 19 small to medium size BLACKS my self. It was really hard to see them because of about 1/2 inch of snow was hiding them. Next weekend should be excellent if the snow melts & it warms up. The Lapeer radio station said they were expecting 6 to 11 inches of snow today & tomorrow. J.P. P.S.No verpas (Caps), May apples & wild flowers are small. Only the members who attended the hunt know the SECRET spot where they grow. I work in the new center in Detroit Michigan. I love mushrooms and am a third generation picker, but I was amazed to find 3 morels in one of the tree beds in the city. So I guess they are everywhere. What a blessing!!! Found about 100 blacks yesterday and a handful of grays in Calhoun County, Michigan. Searched for 4 hours on Saturday and became lost, only to find ONE Verpa Conica, the precursor to the morel! Washtenaw/Livingson County area. Found my first morels in lower MI today. I went to three spots different spots(all except for one which I visited last week and found nothing). The first spot found around 20 or so grays (and some stems), most of them 4-5 inches tall. Second spot found both grays and yellows but left them because they were just popping(less then an inch). The third spot I did not see anything. All three places were pretty dry. Marty in MI . Came back from my favorite spots in the Crystal Mountain area, and have been pulling a few pounds of blacks each day. If and when it warms up, picking should be great. Mothers day weekend will be one of the best in a few years. Happy shrooming. Shroom-meister George. checked my spot, got a full haul (1 pound) wet, mostly smaller than I expect, 1" to 3" max. last year I looked later and they were bigger but no more weight after drying. Found about 50 in my old apple orchard in the Brighton, Michigan area. First time I have ever looked for them on my 5 acres. Not a bad day. We have picked @ 4 to 5 lbs. 3 to 5 inches tall in washtenaw county. No blacks found this year. I would think its almost over in the SE corner of Mi. Not a good year. Found a handful of small blacks near motley, MN today. Gonna be an early season! Finally found 10 small yellow ones and 8 gray buttons. A couple of the grays were peanut sized. Cold spell put a stop to them apparently. Found these on the Cannon river South of Twin Cities. 25 good sized yellows yesterday 5/21; in swamp/marsh area with no competing vegetation, only dying leaves in poplar stand. Found as singular growth pattern approximately 1-2' away from the base of the trees. Appeared to be at peak height...we will be out again tonight no doubt! Found two small deliciousa (type E) on April 2. Looks like a poor season here this year, unless it's late. Looked in normally good places, no others found as of April 10. Went today three small yellow mushrooms. Thereout there just hard to find.. J.J.
mark p here from k c mo. found 7 grey's 4-1-05 at my early spot. their starting to pop mere in missouri. good luck to all hope it's a good year. Here in Ste. Genevieve County, it's early Morel Season, but I did find 4 blacks yesterday! Central Mo. Friday April 8th, we found 2 small greys and 3 red Elephant Ears. It's early and dry. 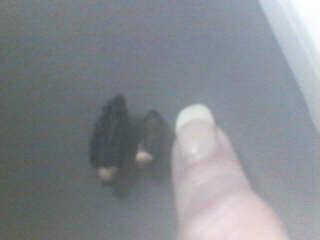 Terri H found 2 small black ones on 4/10/05 in Jefferson County Missouri. TE here from Kearney, MO. found my first small batch of grays on my lunch hour. I'm going tonight after work. Happy Hunting Everyone! Found 18 small gray morels Monday April 11 in Southern Lincoln County here in Missouri. Drew in Kansas City Missouri hunted April 11th in same spot from last year. In less than ½ hour found 15  2 greys rest white/golden. Approx 6 oz. Let the hunting begain! They are a popping in Mid-MO, I found 70 grays and yellows yesterday (4/12) near Columbia Missouri. In one spot they were huge for this early in the season. I found one that was nearly 6 inches tall and 4 inches across. By itself it weighed over half a pound. I have never seen them this big so early. they must have been up for many days. See you in the woods history. found 6 or 7 small grays. had to move leaves to find them, I've never seen the small gray ones before. They were near a small ravine, or a "not quite a creek" outside of Iberia Missouri. I know there's a patch of yellows back in that area every year, so hopefully this is a sign of things to come. I've got to get out of this office and get back out there!!! Were from Laurie Missouri and on Friday 4-15-05 my boyfriend found 30 deep in our backyard and on Saturday 4-16-05 he found 53. Oh boy what beauties!!!!!!!!!! This is Todd K. from Nashville TN. Traveled to Perryville MO on Saturday April 16th. Found 80 yellow and grays ranging from 1 inch to 6 inches. Most were fresh and were found around ash and elm trees. We went south to Kirksville looking for morels today. Found a few small one's in Missouri, but we found more grays and yellows in Iowa. Biggest one is 3 1/4 inches. YUM! We found those north of Ottumwa. Hopefully with warm weather they will be up around Waterloo area soon, like this week. It's On! Hubbie nearly ran over a morel mushroom in the back yard 40 feet from the house with the riding mower. He showed me his find, which prompted me to immediately tromp off into the woods with the 13 month old baby strapped to my back. Found about 20+ morels, some of which were fairly dry (it hasn't rained in about a week.) I was pretty happy 'cause I haven't had a successful morel hunt since I moved here two years ago. May 3, 2005 -- Went off into the woods again, this time found 10 more, half were quite dried. Season may be tapering off unless we get a good rain! 'Course, I'm only hunting on 11 unfamiliar acres and I'm rather hampered with a baby strapped to my back! I have about 30 growing in redwood chips covering my front yard. Some are at least 7 inches hig and 4 inches wide. The mycologist at UW said they are a new species. We are unfamiliar with hunting and are hesitant (afraid) to eat them. The cap is solidly on the stem, some have a tiny hole at the very top. They all look delicious. The newspaper doesn't seem to think this is unusual but I feel that they are uninformed. Hello Doctor, We happily welcome Nevada to the Sightings Page. Yes, they are morels. They are at full maturity when the pits on the cap are fairly open as are the ones in the pictures you forwarded. 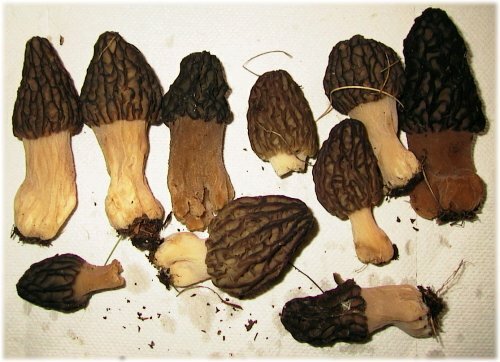 Here is some general information about identification of morels: Morels range in color from white to tan to black. Sizes vary from less than a quarter-inch to fourteen inches tall. What they all have in common can be narrowed down to three characteristics. One - they all have a spongelike or honeycombed cap with true pits and ridges rather than folds or creases. Two - when sliced in half, the cap and stem are completely hollow. The key word is "completely". Completely means that, other than the occasional sowbug or springtail (both are insects common to morels), the inside of a true morel is not chambered and does not have a cottony substance. Chambered or cottony interiors are indicative of some of the false morels. Three - The cap and stem are connected to each other at the base of the cap rather than up under the top of the cap. 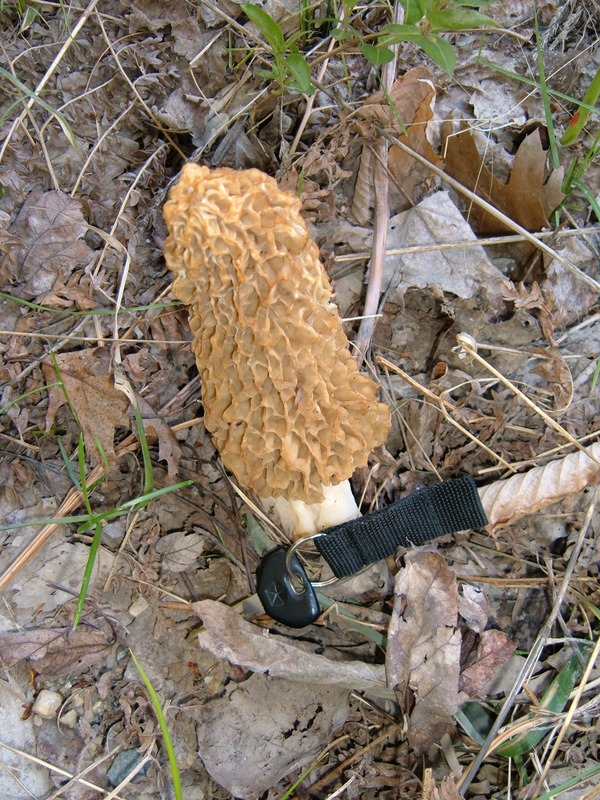 In other words, the cap of a true morel does not hang down over the stem. There is one exception to rule number three which is the half-free morel, but that's in your favor. If you follow the three rules, you can't go wrong. Some people are allergic to morels just as some people are allergic to apples. Remember, whenever you want to try eating a mushroom you're not familiar with, check it in at least two field guides. If they say it's edible, try just a nibble, wait 24 hours, and if there are no ill effects then consume larger amounts. Tom Nauman, Morel Mania, Inc.
talk about finding a needle in a haystack. the morels were so small and under leaves, i had to look several times before i spotted them. , i go to this spot every year, morels are coming up late this year im guessing because of the cold weather were still getting. im hoping to find some more this weekend after the nice weather this week and rain in the forecast. i hunted in sussex county. Found 4 yellow morels in my favorite spot in Harriman Park, just south of the Bear Mtn. Bridge. Not as plentiful this year as other years. Maybe I'm a bit late in looking. Found around 50 blacks in Cambridge area. Desperately need rain. Very dry for April around here(west central Ohio). Anybody in southern Ohio finding any yet? 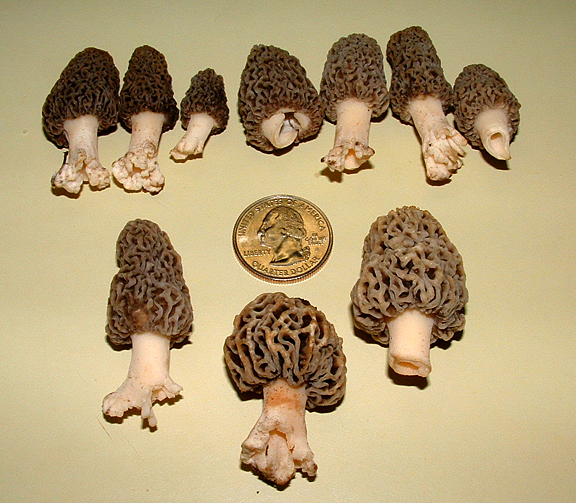 I found my first gray morels for this year April 22, 2005. My first batch was 45. Located in Morrow County Ohio. I have hunted for years and my biggest find was 13 pounds in one day. Good Luck to everyone out their. Hope this year is a good one for everybody! The state of Ohio, Mercer County to be exact about 7 miles from the Indiana line. Found 270 between 4/29 and 5/1 in northwest Ohio. They ranged from small 1" grays to 4" white and yellow ones. Perfect time right now here. A.J. hello, my name is cara and i live in stroud, oklahoma. on march 25th and three in the afternoon i found 2 very small little greys in my faovrite hunting grounds. we are all very excited. looks like the hunt is on. lol. Tom,thought i would let you know my wife and i got 8 blondes in ok. payne co. 3-25-05 and today 4-7-05 found one of the biggest blondes i ever seen,10'' around 5 1/8 tall the other was average size we live in union co. ms. I was in paducha ky. 2 weeks ago did not score,been hunting for 20 yaers now. Hi, Scott. E. Me and my buddy Leon. W found 42 blacks on 4/3/05 north west of Chickasha, Oklahoma, going again this weekend, hope we get some rain though, just starting to come up there Need that rain. Good hunting everyone. Hi , this is Scott Evans me and my buddy Leon Willams found about 42 blacks north west of Chickasha , Oklahoma 4/3/05 just coming up there, going again this weekend hope to find more, good hunting everyone. April 3, 2005 Central Oklahoma, My son Gary Jr. and myself went on our annual Mushroom hunt. He comes down to Oklahoma from Ohio for 4 days to hunt morels. It's dry here in central Oklahoma, but we did manage to find approximately 400 in the 4 days we hunted. There are new grays and yellows in the woods that have some moisture. If we don't get a good rain soon, this year will be somewhat scarce from our usual finds. They are up though, just have to hunt and walk harder and longer this year. Good luck to all. Gary Sr. & Gary Jr.
Scott Evans and Leon Willams, found about 42 blacks north west of ckickasha, Oklahoma just coming up there, need a good rain, going again this weekend, hope to find more next time. My partner in crime, my husband and I found 86 shrooms. They where all wonderful find. We are west of Tulsa, OK.
found about 4 dozen nice m. esculenta in Jenks/ Glenpool area ( s. of Tulsa) yesterday, 4/9/05. left some others that were already too old. some were slightly immature, but most just right and quite large. also found 4 in Tulsa proper on 4/9. these were all slightly immature. dean m., Tulsa, Ok. Here in the Oregon Cascades for the last two weeks anyway I have pulled out about 30 lbs or so. That is 4 days of hunting in the last two weeks. Some people are doing much better but as for myself I am a happy hunter. They’re poppin’…. 4,500-5,000 ft in the damp duff beneath the Douglas firs east of Ashland. 2 lbs of easy picking this afternoon. I found some of just about every variety. Southwestern Pennsylvania. Warfordsburg, Pa. 1 ½ mile walk, 3 ½ hours. I’ve been going for 20 years + and really enjoy it. I have about 15 miles of area (patches) I cover each year. Wish there were more around here that enjoy it as much as I do (or spend the time I do) I just started taking pictures this year. It really helps when you have the experience and can 'read the land' to find them. I think I know just about all the standards of each variety. Westmoreland County. New Stanton area. Today went with a friend. he has never hunted roons.We walked into what looked like a good area. Ash, birch, old crab apple trees, some May apples, grassy, the ground was moist..just about for roons to grow..saw an area full of deer tracks...hmmm .....found one four inch half hidden under a leaf...called my new hunting buddy with the news, asked him to come over and find it....after about 5-7 min he found his first one. Had him smell it ( i'll never forget my grandfather doing that to me about 50 years ago ) Now he is hooked for sure....i made it back up the hill side..while he went after a new trophy...had to stop for a breather, and could hear him off in the distance.felt good to sit down.. About 30 min later he yelled " I found 3 more "...made it over to check the roons ...Nice find...they were small yellows..he found them in the same ground conditions.....felt good inside...he now has the eye for the area's they grow in ..and the ability to SEE them, when your looking straight at em. ..now we just need about 5 big poke sacks filled..
On April 6th 2005, I found six morel mushrooms in upper East Tennessee. I was so excited! I have only found 3 prior to this discovery during my whole life-all on different occasions. New update: Rained all day yesterday, but my son Scott made up for it today-2 1/2 hours in the morning and 2 1/2 hours in the afternoon. 17 pounds! This is not even "hunting" mushrooms, instead it is simply picking nonstop from the time you enter the woods. I live in Middle Tennessee, and I usually find the first black morels around the last part of March, and about two weeks into April. This year and last year have not produced very many shrooms. Two years ago I found 328 black morels in one afternoon, some very nice ones around old poplar trees. This year I went back several times to the same location and found nothing! I don't know what is going on. I did manage to find some good sized yellow morels in another location, but things have been dry here for about 2 weeks now and can't find any right now, maybe after next rain comes around I will start hunting. I hope all mushroom hunters good luck! TP. We found 7-8 fresh beauties circling an ash in an ash-laden woods in Guilford Vermont. It was pouring rain and the temperatures have not been quite warm enough. We hope the season is just getting a late start here. found 22 greys in northern virginia (picture inclosed) and friend that was with me aslo found 30 growing in the same area mostly greys couple of yellows and 1 white, still cold at night. hi,we found 5 pounds of true morels in bellingham washington in thick beauty bark .this is on campus WWU .the gardener got all upset that we picked them.she likes to look at them.we told that we like to eat them.so we left some for her to look at. We picked about 10 pounds of Black Morels in a 2004 clearcut in the Columbia River Gorge. Nice sized shrooms, great flavor! We finally found 13 blacks on Thurs, the 14th. Our friends over the ridge from us found 4 small black ones on Tues, the 12th. We are going to look for more now. Tyler Co. Best of luck to one and all! Hi, Found about a pound of mostly black morels (maybe 2 or 3 yellows) on 4-22-05 in Hampshire County, WV. I also found 7 or 8 black morels on 4-14-05. Great web site -- thanks for the info! On 04-25-05, my father-in-law found 11 dried-up black, and 1 small yellow in the Jackson/Mason County area of West Virginia. Uncooperative weather has made this a poor year around here. We usually start finding them around April 15th or a little earlier. This was on his 3rd trip out. We are going out again on Monday if the rain allows, otherwise we can't get the truck out to our spot for all the mud! We find them in thick stands of tulip poplars and some sassafras and ash. --Amanda W.
West Virginia--Jackson/Mason County area: We found 19 gray and 1 black. Most were thumb-sized, except for 8 nice fat grays we found behind a dead elm tree, approx. 4" x 3" caps. Kinda disappointing though, after hiking 4 miles up and down ridges and through heavy underbrush. At least we weren't totally skunked! --Amanda W.
Jackson/Mason County area, West Virginia--My husband and I found 62 very nice yellow morels on 05/07/05, all averaging 3" caps. --Amanda W.
Found our first greys yesterday. 43 little greys from about 1/2 in to 3 inches tall! The hunt is on in Wisconsin! We found two small morels on a south facing limestone bluff in Rock County Wisconsin on April 17. They are about one half inch tall. Good Luck! Tim K.
On April 21st, my husband and I found 10 - 15 in an area that gets lots of sunshine growing in two places of which there used to be (many years ago) two Elm trees. The trees were cut down and the stumps removed long ago. The morels were 2-3" in height. Checked a couple trees on the way home from work, ended up finding about an ice cream bucket full cleaned like these I am holding. All south facing hillsides. Some around apple trees. will be posting more pix later. Hi Tom - Shrooms are finally up! Found over 200 greys on my lunch hour today under two separate dead elms. We need rain in Southern Wisconsin! Can't wait to see you, Vicky and the Nauman clan on Saturday. Hopefully you'll be able to get out and hunt with me, Rat, the Pease clan and Licavoli up in Boyne next weekend! Finally found some around Whitewater--10 medium sized greys yesterday in dense woods. They had no frostbite or dryness, and were in very good shape. I think the darker colder spots are filling up as we speak. Also 30 tiny to large yellows among grass on a south-facing bank over my lunch hour. They weren't as pristine--a little moldy, a little chewed up. It's been very dry until recently, so I think the season is prime now and will go for a couple more weeks. I'm spending the whole weekend in the woods! from Cody, WY found 15 morrells in back yard today: 5 22 05. Have lived in this area for 25 yrs and this is the first time I've seen morrells since leaving Missouri years ago. Hello Ontario Morellers cheer-up the goodies are coming. 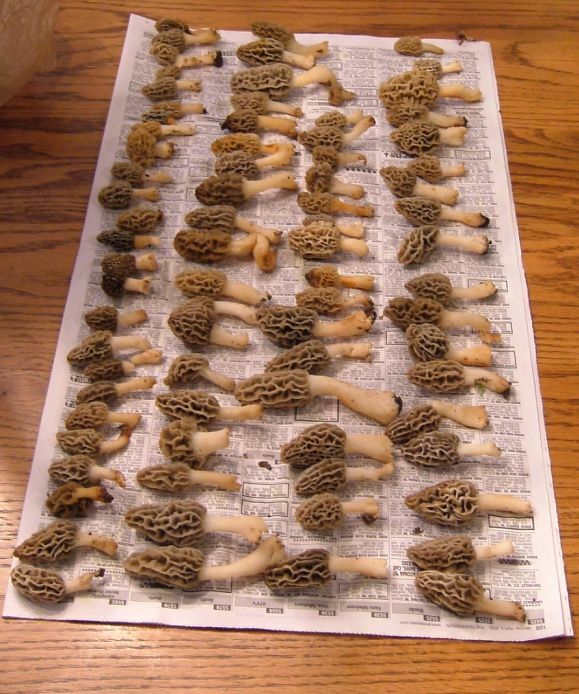 Today Apr 21, after intensive search spotted 3 Morchella elata(Conica variety), toller 3" , all very fresh just out of the ground in mossy area with poplars mixed with white pine and lots of underbrush. Southern Ontario in outskirt of Toronto. Good luck to all. Umberto and L. P.
found about 20 blacks and about 15 more yesterday (Kitchener area). Hope to hear about more sightings in Ontario soon. I was working in the Windsor area this week and found my first of the season. 48 under one dead elm, and another 100 or so around cottonwood. Essex County, Ontario. Went Morel picking for the first time. About 1.5 hours north east of Edmonton, Alberta, Canada. Our friends have been picking there for years. Only blacks yesterday, we looked for about an hour and only came up with about 30 of the black gems. My friend says that it was just about too late already but in about 2 weeks they become visible a bit farther north. They said we were crazy for going out so early but we got about 30 decent sized black morels from 2 to 3 inches in height.Three or four yellow morels as well. Habitat: Bottom third of Manitoba on either side of a cow pasture that was partially flooded,swarming with frogs and cow plops,growing under and around groups of SPRUCE pine trees that grew on the outskirts of a poplar grove. Just in open areas that could get sunshine,slightly elevated and not flooded.We didn't have to go far into bush...all morels were close to the open field near the Spruce trees. Plant hints: The dandie lions have been up and in bloom for just over a week,The bleeding hearts are just in bloom,the Lilacs are in partial bloom,My ornamental crab apple trees are in full bloom,the Crocus are already up a week,Mosquitoes are around but not overwhelming just yet,The grass is low and still easy to see thru and the ferns are getting about a foot tall but not spread wide yet.The grouse were making thier mating sounds (thumping thier wings) Not all these plants are where the Morels were but watching them near where I live is a good indicator of when to start looking. Many thanks to everyone who has helped me find my first wild Morels,many thanks to my Mom for finding people who knew where to look and were willing to share thier knowledge. "It's who you know and where you go..." P.L.